Ringworm is a scaly rash, ring-shaped fungal skin infection that is contagious and children are more susceptible to it, especially the ringworm of the scalp. Tinea Capitis, which is commonly known as scalp ringworm is very much rare in adults and occurs in children within the range of 2 to 10 years of age. When affected, the hair may be brittle and because of this it may fall out easily. The child's scalp will show reddened or gray skin with round patches of scaly. The neck may have tender lymph nodes and there may be rashes elsewhere on the body. 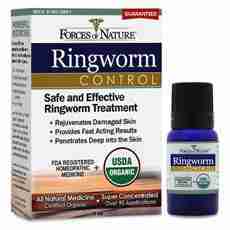 The children can also be affected by other types of ringworm. One with circular, itchy rash is known as tinea corporis or commonly known as body ringworm. Another one is athlete's foot or tinea pedis in which the skin of the feet becomes white and there are rashes all over it. Usually oral anti-fungal or topical medications are used to treat ringworm in children, but some may prefer homeopathic treatment as a better option. The people practicing homeopathy usually give a tiny amount of a substance in order to stimulate the body's healing responses and treat the disease itself. Mineral, plant and animal substances are used to make a dilute substance. It is believed that the healing qualities of this small amount substances are retained in its memory. Hence, homeopathy is preferred by many individuals as a treatment for ringworm and here are some homeopathic cure for ringworm in children. The leaves of poison ivy are used to make highly diluted oils, which is later used to produce rhus roxicodendron. It is believed by the homeopaths that leaves are most potent at night, hence 2000 leaves are harvested at that time. If there is stinging, itching and intense burning from the infection, then rhus is used by the homeopaths. Rhus is more likely to be prescribed by the homeopaths if a hot water bathing or heating the area improves the symptoms. Highly-diluted and dried squid ink is used to produce sepia. If there is a brownish or reddish rash on the skin because of the skin conditions like ringworm, then sepia is more likely to be advised by the homeopaths. When prescribing remedies, aggravate or worsen symptoms are taken into account by the homeopaths. For example, if the warmth of blankets makes the child chilly and overheating and sweating causes itches, then sepia will be the right remedy prescribed by the homeopaths. Sepia is also recommended when fresh air improves the infection, but is worsened with dampness. As we all know that homeopathy is not intended to be as a medical treatment's replacement, but is just an alternative therapy. It is used to treat many infections and illness, but it is always recommended to consult a doctor or a health professional before using any of the homeopathic therapies.